We are visiting a cluster of interesting sights in western Provence. 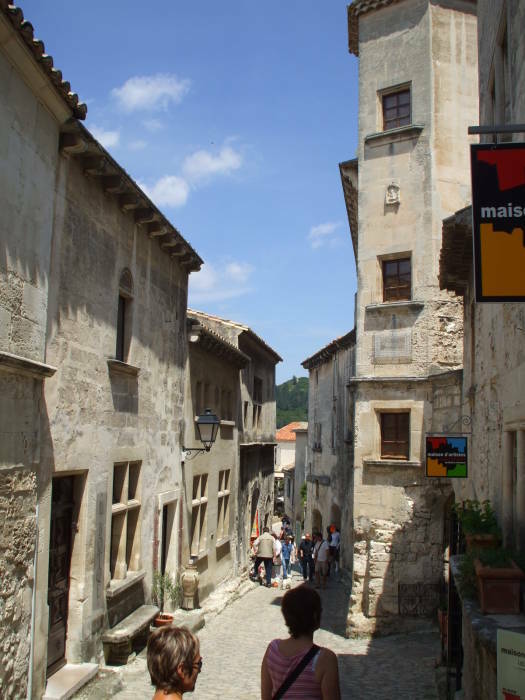 These sights are between the cities of Avignon and Arles and to the north-west of Marseille. They could easily be visited on a day trip out of any of those cities if you have a rental car. The three sites are Barbégal, a Roman water-powered industrial complex and its aqueducts; Les Baux-de-Provence, a fortified hilltop town; and St-Rémy-de-Provence, where Vincent Van Gogh spent about a year and produced about a hundred oil paintings of the setting. The sites are small, and we will need a better map than one made for zooming around in high-performance aircraft. 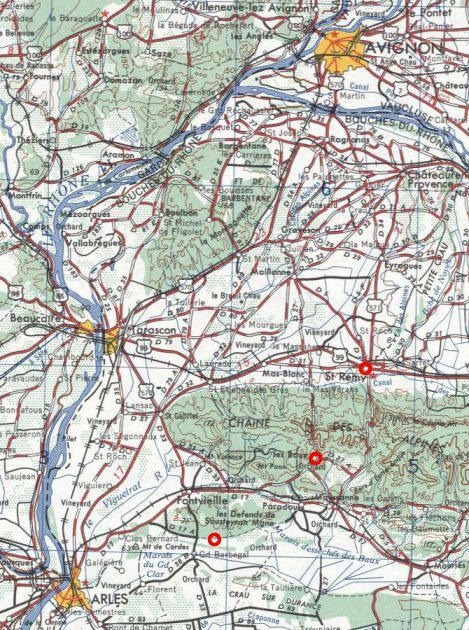 The U.S. Army Corps of Engineers map NK-31 is freely available and it shows far more details, although it dates from the 1950s. That's what you see below. You really want the current Michelin map! 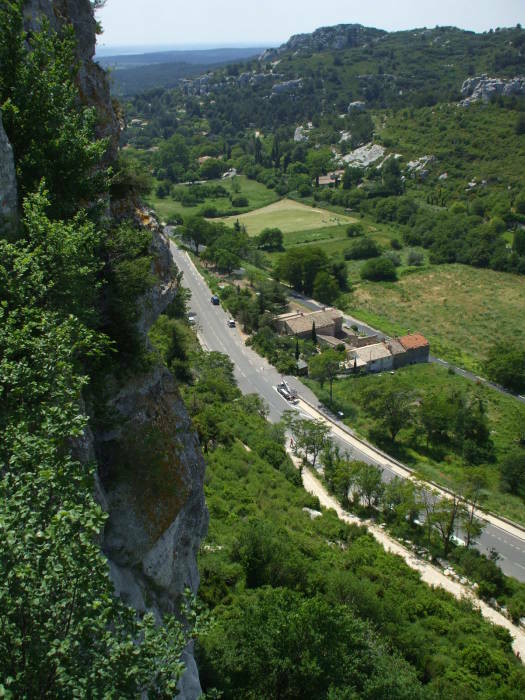 The three sites we'll visit, Barbégal, Les Baux-de-Provence and St-Rémy-de-Provence, are close together in a path over a small mountain range called Les Alpilles or, as shown on the below map, Chaine des Alpines. "Little Alps", if you will. See the red circles added to the map. Barbégal, closest of the three to Arles, is a Roman water-powered industrial complex and the aqueducts supplying its water power. Les Baux-de-Provence is a settlement built atop rugged rock formations. St-Rémy-de-Provence, northernmost and closest to Avignon, has a peaceful hospital built in a former monastery. This is where Vincent Van Gogh spent about a year near the end of his life, its grounds the setting and subject of about a hundred of his paintings. U.S. Army Corps of Engineers map NK-31 is available at the Perry Castañeda Library Map Collection. Grid 21 contains the sites described on this page. 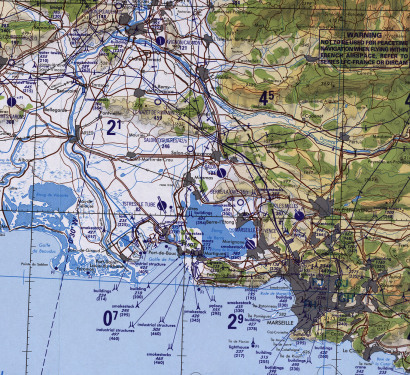 This section of Tactical Pilotage Chart F-2D shows the region from Marseille to Avignon. The full map is available at the Perry Castañeda Library Map Collection. Barbégal is not very far out of Arles, but few visitors make their way to this interesting site. 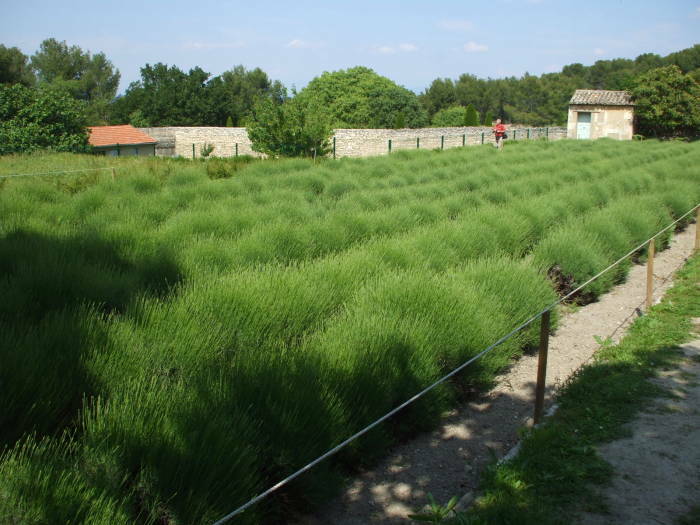 The nearest village is Fontvielle, on the D 17 and D 33 roads and about 17 kilometers from Arles. The D 33 road runs north to south through Fontvielle. 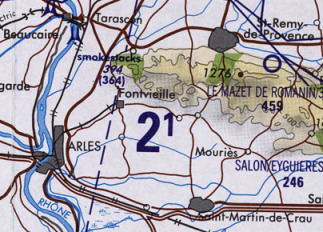 East of Fontvielle on the D 17 where it intersects D 78C and D 78D is Paradou, a small village. It's marked on the NK-31 map below. The small D 78E or Route de Belle Croix road runs south-west out of Paradou, turning into the Route de l'Acqueduc. This is a minor country road, shown as a dotted line on the NK-31 map at right. That road eventually intersects the D 33 and becomes the D 82, but you reach the aqueduct shortly before that. 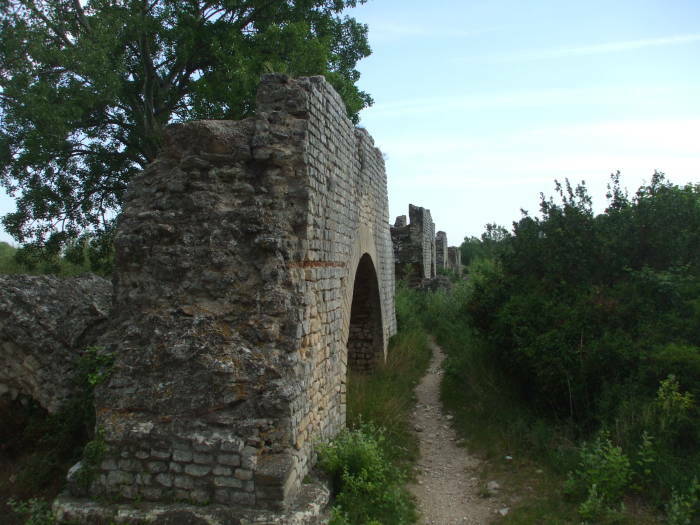 The road intersects an arched stone aqueduct, running through a narrow passage cut through the structure. Don't worry — if you get on the correct road, you will notice the aqueduct! The road narrows to a single lane to pass through a former archway. As you quickly realize, this is actually a pair of parallel aqueducts running from north to south. 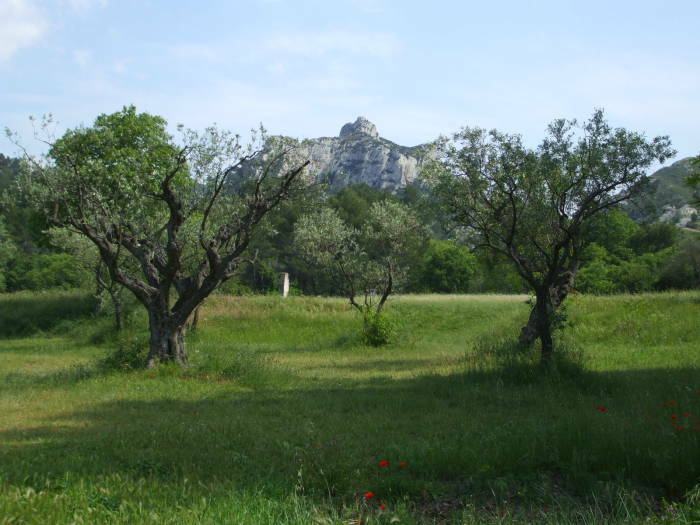 There were two sources of water, one coming from the northern slope of Les Alpilles and looping around its west end to approach from the northwest, the other from the southern slopes and approaching from the northeast. The northern aqueduct was about 39 kilometers long, the southern one about 11 kilometers long. The two came together at a point almost directly north of this location, where a bassin de convergence or convergence basin with a system of moveable gates allowed for isolation or cross-connection of the two sources supplying two users of water. Their routes from their origins to the convergence basin, and then south from there, required a number of aqueduct bridges across small valleys. One user was the city of Arelate, as the Romans called what we now call Arles. The northwestern source was the primary supply of the city's drinking water. The other user was the complex of grain mills at Barbégal, a facility really deserving the name "factory" due to its scale. The northeastern source was its primary supply. This complex is the largest industrial facility known from antiquity. 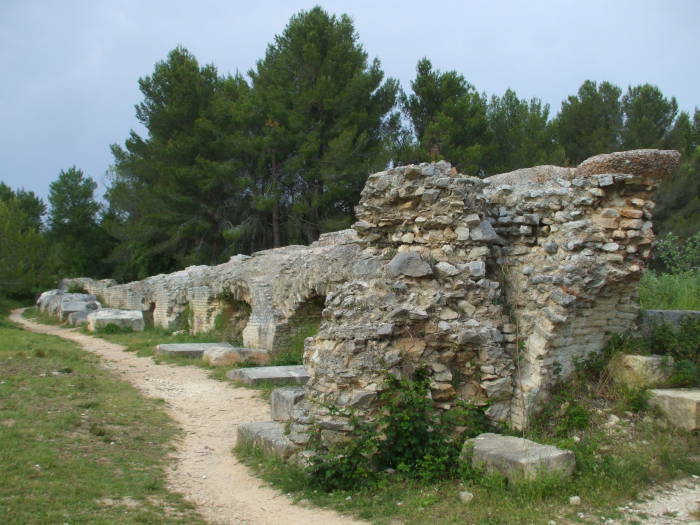 Similar factories are now believed to have existed at Rome and at a few other cities of the Roman Empire, but this is the only one where its remains are known and studied. Depending on the relative supply flows and the current needs, the gates at the convergence basin might be configured so the two aqueduct flows ran right next to each other but did not really connect. Or, the sources might be connected partially or entirely to both destinations simultaneously. The combined flow of both sources together has an estimated maximum potential of 1,350 liters per second. However, the flow resistance in the channels limits this to an estimated total of 240 to 300 liters per second. 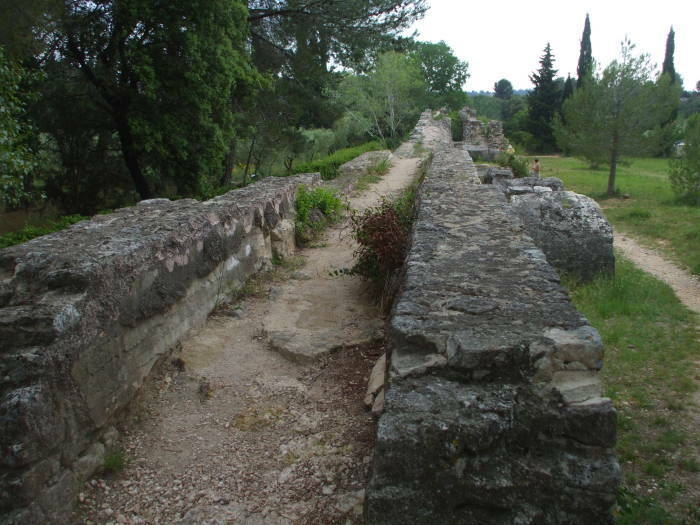 The aqueduct channels were lined with cement. 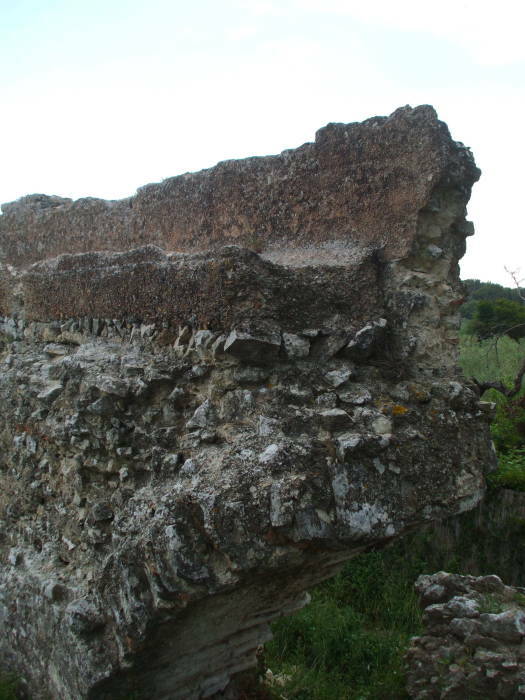 The formation of carbonate mineral deposits on top of that cement allows for estimates of how long they were used. Also, some coins have been found in and around the structures allowing for further dating. 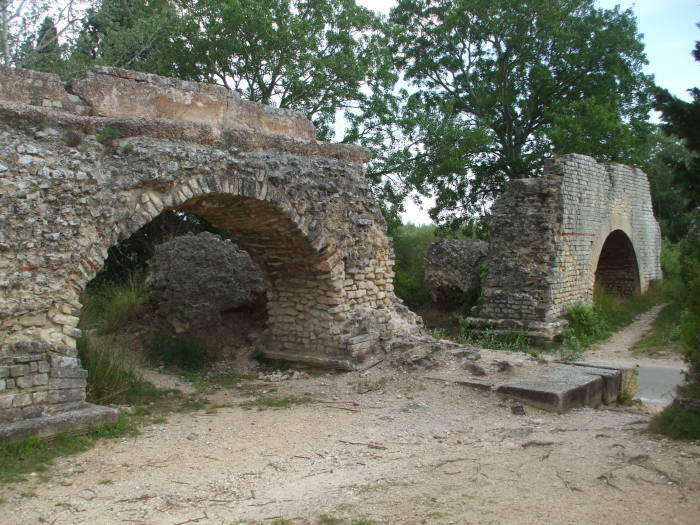 The aqueduct supplying Arles was built in 40-50 AD. The second aqueduct was built later, with the convergence basin completed in the period 103-111 AD. The mill complex was then used at least through the 4th century. The area continued to be inhabited into the Middle Ages, with a Carolingian (early 800s) cemetery located nearby and other habitation continuing beyond that time. Eventually, however, these large stone structures were somehow "lost". When an old thing sits in one place for a long time, we no longer notice it. These ruins become part of the background for a sparse and uninterested rural population. It wasn't until 1940 that the French archaeologist Fernand Benoit published his investigations of the site, finally revealing it again to the world at large. Slave labor was available to the Roman Empire in large numbers and at low cost, at least during periods when the empire was expanding through military force. The easy availability of slave labor discouraged any development of industrial power. So, while some aspects of agricultural and construction work can be effectively carried out by manual labor of slaves, the Roman Empire could not develop any industrial processing and therefore they could not grow beyond a certain limit. Put simply, this theory says that the Roman addiction to slavery prevented industrialization. I suppose it could be argued that the southern half of the United States of America was in a similar situation in the 1800s, specializing mostly in agriculture with relatively little industry. However, if you continue down the path about a kilometer from the intersecting road, you find the disproof of this historical theory, at least as it applies to the Roman Empire, in the Barbégal mill complex. This is an example of something that some history books claim never existed — a large scale Roman era power-driven mass-production factory. 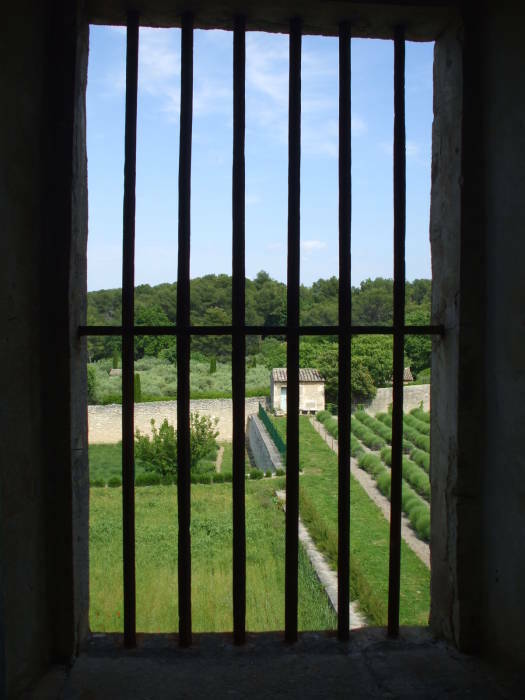 The Roman economy may have been addicted to slavery in some ways, but this did not prevent them from developing significant industrial systems. We simply forgot about it until the 1940s, partly because historians discovered temples they found to be more interesting than industry. Another bias in what we know about the past has to do with what survives. Mills are largely wooden structures in damp places, and so they don't always leave clear remains. There is archaeological evidence for only about a dozen water mills from 11th century England, but the Domesday Book records 5,624 of them. The mill complex had sixteen waterwheels in two series of eight each. As the terrain dropped down a slope, the water was split into two forks, each flowing over one overshot waterwheel, driving that wheel and collecting in a lower pool. It then flowed over a second, a third, through the eighth. It was common in medieval times and later to have a series of water wheels along a stream. This complex put all of the mills under one roof within a single structure about 42 meters long down the slope by 20 meters wide. The streams and water wheels were down the exterior sides, and a service passage ran down the center to haul the grain in and the produced flour out. You can argue about the relative efficiency of draft animals for turning mill wheels. Oxen are rather slow, but they can pull a heavy weight without being strangled by their harnesses like horses. However, water power can spin mill wheels much faster than any draft animal, greatly increasing the production. The water wheels were 2.1 meters in diameter and 0.7 meters wide, based on the stone wheelboxes. Their horizontal axles passed into the mill house, where wooden toothed wheels coupled them to a vertical axle spinning a basalt millstone 0.9 meters in diameter. Output estimates vary because we are not sure of the precise gearing, thus the rotational speed of the millstones. However, the available water power could have spun the millstones at 30 revolutions per minute, producing 24 kilograms of milled flour per hour. If you assume 50% downtime for periods of low water supply, maintenance, late arrivals of grain supply shipments, and other outages, that means an average of 4.5 metric tons of flour per day, estimated to be enough to feed a population of 12,500. That is close to the estimates of the population of Arelate at the time. A few other Roman mills of this period were used to drive reciprocating saws. The sarcophagus of the mill operator Marcus Aurelius Ammianos at Hierapolis has a carved illustration of his mill. It shows a diagram of a mill wheel driving a gear train and cranks and connecting rods to power two saws cutting rectangular blocks. This is the earliest known example of this type of machine. A similar system was excavated at Ephesus and it's possible that one could have been built here. "A Roman Factory", A. Trevor Hodge, Scientific American, Nov 1990 pp 106-111. "Paleohydrology", Kenneth R. Wright, American Society of Civil Engineers. Drive east from the Barbégal aqueduct to the village of Paradou and then a few kilometers north into the rising Alpilles on the D 27 highway, and you soon come to Les Baux-de-Provence. Bauç is Provençal for a rocky promontory or spur. It's a high point with very steeply sloped access, making it more easily defensible. There are signs of habitation dating back to 6000 BC. A group burial from the Bronze Age was discovered in Costapéra cave in 1928. The Celts used the site as an oppidum or hill fortress around the 2nd century BC. 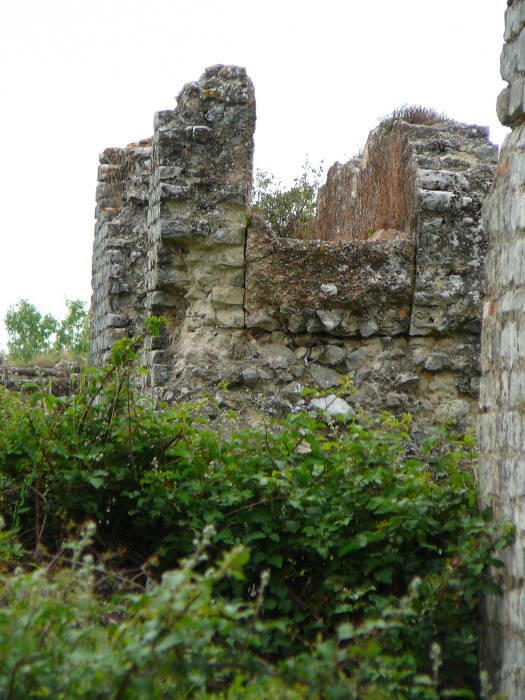 Similar fortresses were constructed in the area by the Trémaïé, the Provençal name for the Three Marys Gallo-Roman Christian group dedicated to Mary Magdaleine, Mary Salomé and Mary Jacobé. The pathway from Les Baux north across the divide of the Alpilles and down to what eventually became the Roman settlement of Glanum goes back to proto-historic times. 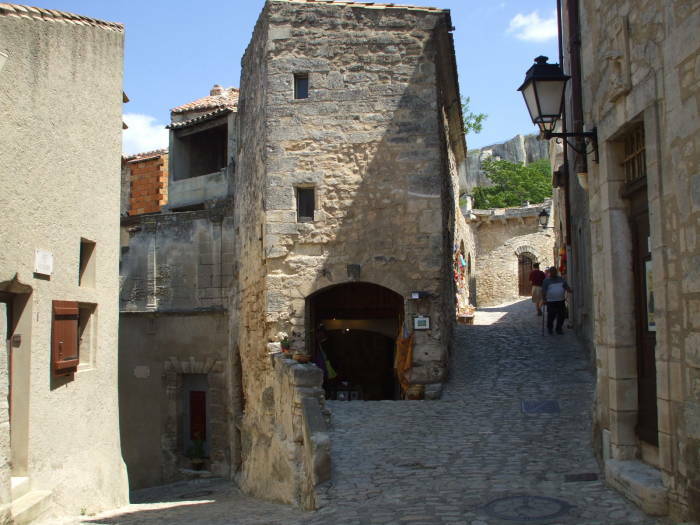 The high point where Les Baux sits today became a permanent Iron Age settlement in the 7th and 6th centuries BC, with a surrounding city wall and stone houses along its streets. The surrounding area supported limestone quarries by the 2st and 1nd centuries BC. The residents harvested grain and traded it for goods with the coastal Mediterranean merchants. However, the nearby Greek colonies of Arles and Massalia or Marseille lured away a significant fraction of the local population. In the Middle Ages the town grew again, becoming the stronghold of a feudal domain that gained power until it controlled 79 surrounding towns and villages. The hilltop fortress expanded to cover seven hectares (70,000 square meters or 17.3 acres), a vast size for that era. The princes of Baux came to claim that they were descended from Balthazar, one of the eastern Magi mentioned briefly in the Gospel of Matthew and possibly one of the priestly caste of Zoroastrianism. Their listing as the Persian Mechior, Indian Caspar, and Arabian Balthazar comes from various western traditions and legends. The Syrian Christians name them as Larvandad, Gushnasaph, and Mormisdas, which at least have a chance of being Persian names; the Ethiopians say they were Hor, Karsudan, and Basanater; the Armenians say they were Kagpha, Badadakharida, and Badadilma; and many Chinese Christians believe that one of the magi was from China. Meanwhile the Lords of Baux said that one of the Magi, their ancestor, was the one named Balthazar. The lords of Baux were deposed in the 12th century, although the elaborate court and culture of the great castle continued. 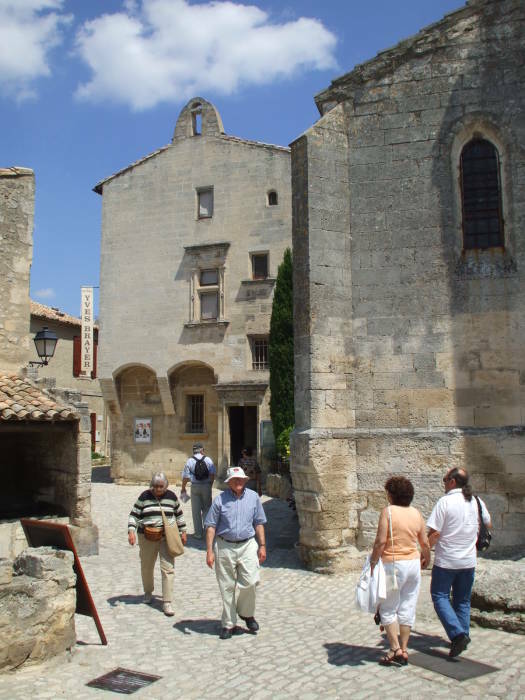 Les Baux, along with Provence, was joined to the possessions of the French crown in the 15th century, governed by the Manville family. It became a center for Protestant revolt. This led to a revolt against the French crown, which in turn led Cardinal Richelieu to order in 1632 that its castle and defensive walls should be demolished. The French crown gave the city and title of Marquis to the Grimaldi family in 1642. The county of a count is usually in the interior of a country, while the march of a marquis is on the border and therefore requires the marquis to defend against neighboring lands. In the peerages or systems of nobility in various European countries and some of their former colonies, a marquis (or marquess in English) is a nobleman of hereditary rank. In the U.K. the title ranks above an earl and below a duke. Not royalty, but considered to be better than you or me due to accident of birth. Sort of like dog breeding but without all the rationality and significance. Yes, many people spell it aluminium. The International Union of Pure and Applied Chemistry adopted aluminium as the standard international name in 1990, but in 1993 they recognized aluminum as an acceptable variant. Officially, IUPAC prefers aluminium, but practically, aluminum is nearly as common in their publications. I'll stick with the no-i spelling used in the U.S. and Canada. The Grimaldi family retains the title of Marquis of Baux today, although the area has been entirely French for ages now. Working in this area in 1821, the geologist Pierre Berthier discovered the aluminum ore consisting mostly of gibbsite or Al(OH)3, boehmite or γ-AlO(OH), and diaspore or α-AlO(OH), mixed with some clay, iron oxides and other minerals. The ore takes its name, bauxite, from the location. The white aluminum compounds plus the bright white TiO2 or titanium dioxide give bauxite deposits a largely white color, with tints of pink from any red iron oxide in the mix. Aluminum salts were useful for dye mordants and astringents for dressing wounds, but it was hard to work with. It was first produced in an impure metallic form in 1825, four years after Berthier's discovery of bauxite here. Before the late 1880s, aluminum was so difficult to extract from its ores that pure aluminum was more valuable than gold The Exposition Universelle of 1855 displayed bars of aluminum. Napoleon III of France gave a banquet in which the most honored guests were given aluminum utensils but the others had to make do with plain gold. The 2.8 kg pyramidal capstone of the Washington Monument in Washington D.C. was the largest single piece of aluminum cast at the times of its installation in 1884, a time when the metal was as expensive as silver. These days you heat bauxite ore in a sodium hydroxide solution in a pressure vessel at temperatures of 150-200 °C. You separate out the iron-based residues by filtration, yielding pure Al(OH)3 by precipitation on cooling. Heat that for conversion into aluminum oxide, Al2O3, which becomes molten at about 1000 °C. Then pass an electrical current through the molten Al2O3 to yield metallic aluminum through electrolysis. These bauxite deposits have long since been depleted. Other locations including Trinidad now supply the world's aluminum ore needs. Continue driving north from Les Baux toward St-Rémy-de-Provence. 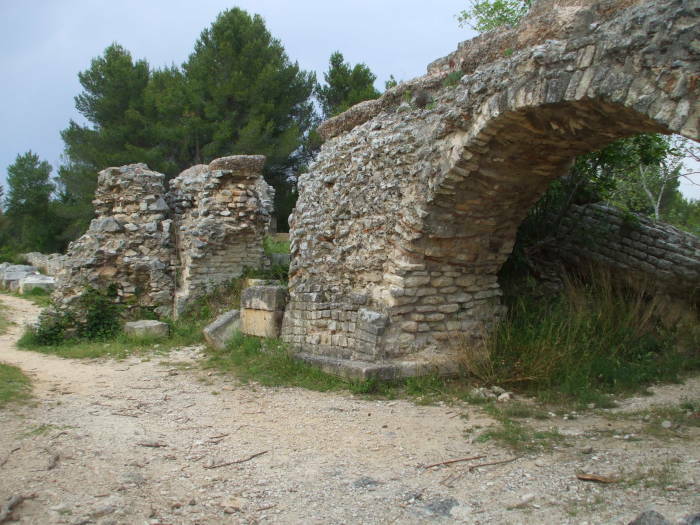 Before you reach that small city you will pass the Roman ruins of Glanum on your right, and soon after that, the hospital and former monastery of Saint Paul. 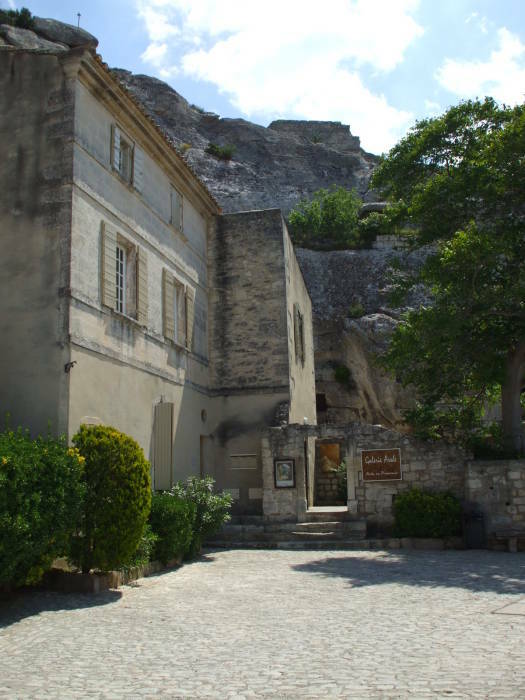 Like Les Baux, the area has been settled since prehistoric times. The nearby Otello cave has decorative carvings dating back to the time when the Stone Age was becoming the Bronze Age. The Maison de Santé St-Paul was a monastery back before 982. It was founded as a priory of the abbey of Saint-André Velleneuve-lès-Avignon. In 1080 it became the head of a group of monasteries organized under the rules of Saint Augustine. Maison de Santé St-Paul in St-Rémy-de-Provence. The monastery was built in the 10th and 11th centuries. In the 16th century, one of the residents of St-Rémy was Nostradamus, the famous apothecary and astrologer. The monastery was modified in the 17th and 18th centuries. It housed a hospital, and then in 1855 it came to be a mental hospital and no longer a monastery. Vincent van Gogh had himself committed to the hospital for a year, from 3 May 1889 through 16 May 1890. 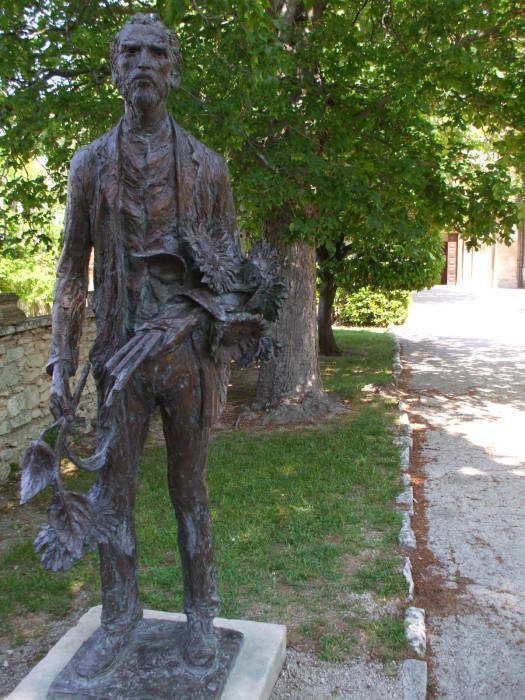 Statue of Vincent van Gogh at Maison de Santé St-Paul in St-Rémy-de-Provence. Van Gogh had been living in Arles in February of 1888, where he hoped to found an artist's colony in the bright light and brilliant colors of southern France. 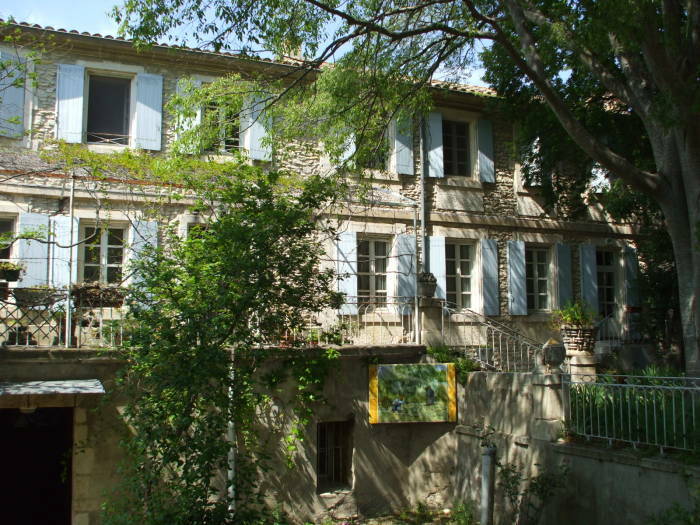 He had persuaded Paul Gauguin to share his Yellow House near the Arles railway station. Gauguin moved in on October 23rd. They worked together for about a month, and then fell into constant arguments. Two months after Gauguin's arrival, Van Gogh confronted him with a razor. Van Gogh then panicked and fled to a brothel he frequented on the nearby Rue du Bout d'Aeles. He cut off his left ear with the razor, wrapped it in a newspaper and handed it to a prostitute named Rachel, telling her to "keep this object carefully." He staggered back to the Yellow House and collapsed, where Gauguin later found him lying unconscious. Van Gogh was taken to a local hospital where he remained for several days, continually asking to see Gauguin. Gauguin had left Arles, however, saying of Van Gogh: "His state is worse, he wants to sleep with the patients, chases the nurses, and washes himself in the coal bucket. That is to say, he continues the biblical mortifications." Van Gogh returned home to the Yellow House in January of 1889, but from then through February he was back and forth between his home and the hospital, suffering from hallucinations and delusions that he was being poisoned. A group of thirty people in the community organized a petition demanding that the fou roux or the redheaded madman be confined for everyone's safety. The police closed his house in March and Van Gogh moved in with a physician. 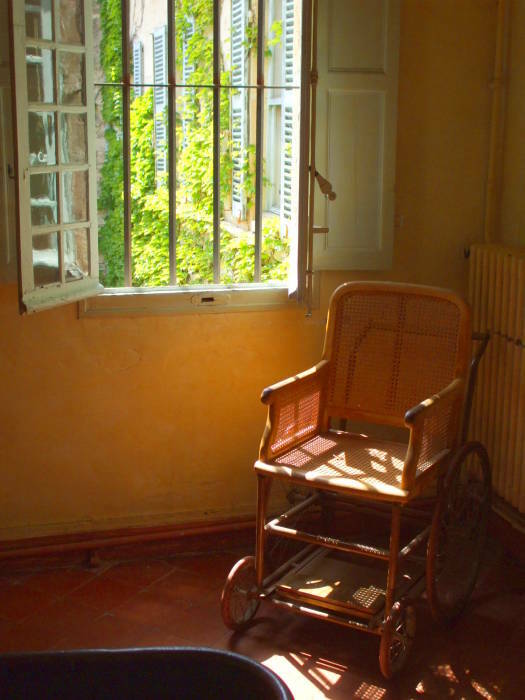 On 3 May 1889 he moved into the hospital in Maison de Santé St-Paul in St-Rémy-de-Provence. 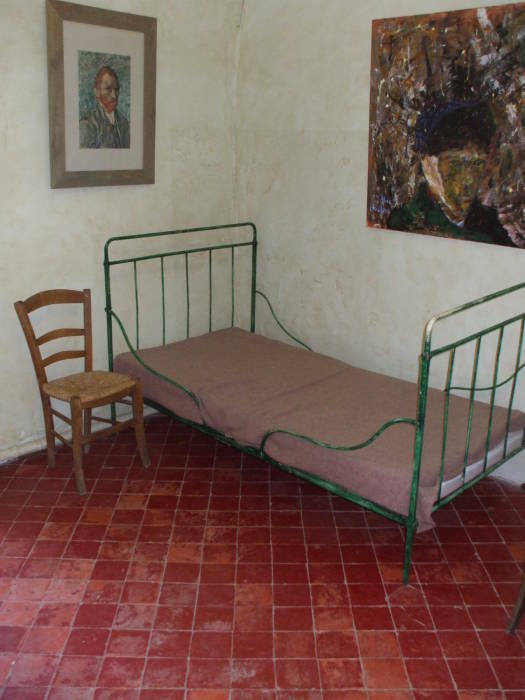 Vincent van Gogh's room in the Maison de Santé St-Paul. He painted at the encouragement of the staff, producing more than 100 drawings and 150 paintings. His year in the hospital is now considered his most significant period of work. Van Gogh's room overlooks one of the two galleries of the central cloister, which was built around 1140-1150. 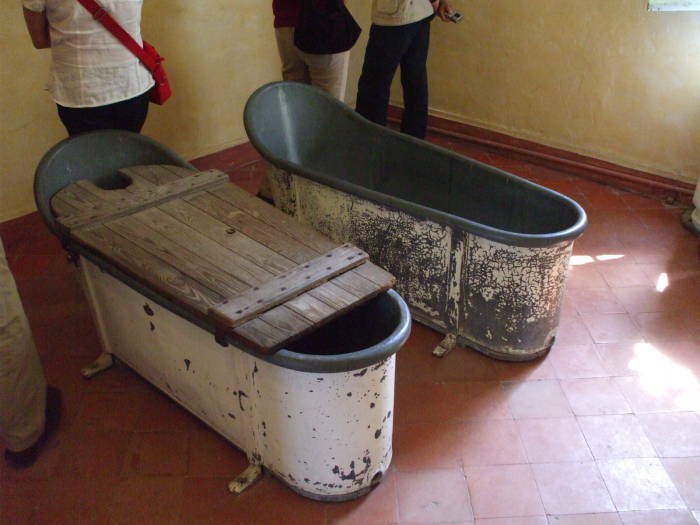 So-called "Hydropathy" underwent a popular revival in Europe in the 1800s. Ancient Egyptian, Persian, Greek, Roman, Japanese and Chinese societies had used various forms of water therapy. The European model of the late 1800s was rather different. The monastery buildings are surrounded by gardens. The one seen above and below is a garden of lavender. The colors of the gardens, lit by the bright sunlight of southern France, inspired Van Gogh. His brother Theo, an art dealer in Paris, kept him supplied with canvases and paint. 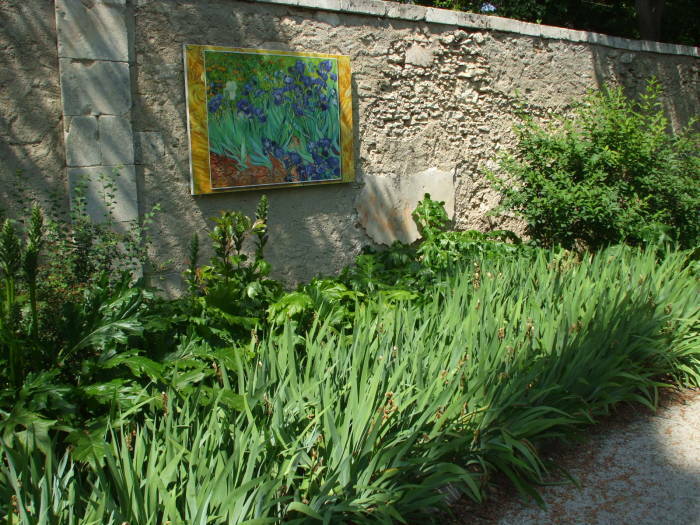 As in Arles, you can see some reproduction of Van Gogh's work in the places where he created them. He created a number of paintings of irises, like those seen here. 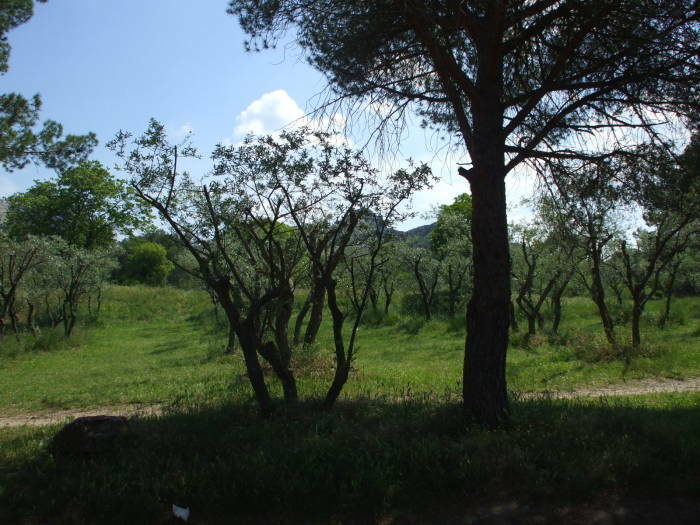 He created several paintings of the olive orchards surrounding the monastery. 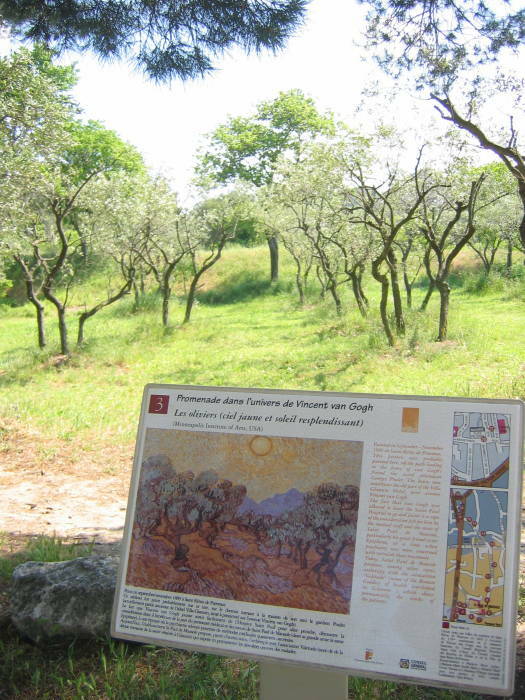 One of those many olive orchard paintings is reproduced where he created it. 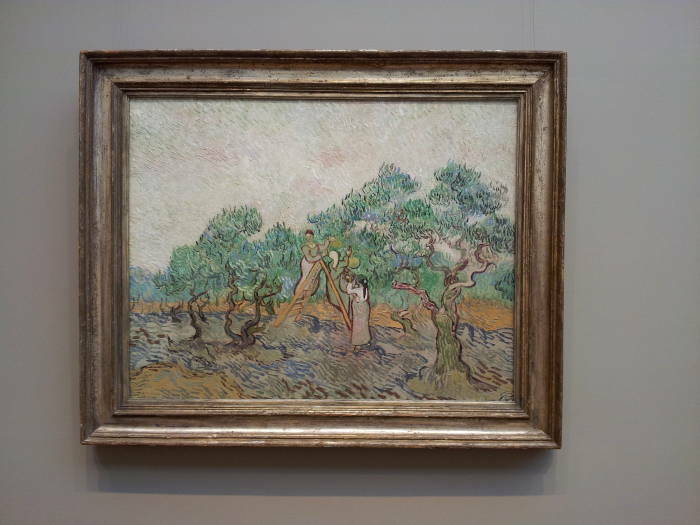 Van Gogh painted this version of "Olive Orchard" at the hospital in 1889. It is now in the National Gallery of Art in Washington D.C. The Chaine des Alpines, also called les Alpilles, rise in the distance to the south of St-Rémy. The hospital was an internment facility in 1914-1918, during World War I. Dr. Albert Schweitzer had been born in Alsace-Lorraine, part of the German Empire at the time. In 1913 he and his wife set off upriver on the Ogooué River from Port Gentil, traveling 200 miles by raft to the Paris Missionary Society's mission at Lambaréné in French West Africa, at a location today in Gabon. They built a two-room hospital and saw about 2,000 patients in the first nine months. As Germans in a French colony when World War I broke out during the summer of 1914, the Schweitzers were put under supervision by the French military in Lambaréné and Schweitzer continued his medical work. By 1917 the Schweitzers were exhausted by four years of work in tropical Africa, with tropical anemia on top of that. They were taken to Bordeaux and interned first in Garaison. Then in March 1918 they were brought to Saint-Rémy-de-Provence for four months where he worked on the medical staff. They were transferred to his home in Alsace in July of 1918. He then had his parents' former (pre-1871) French citizenship reinstated, and became a French citizen. He returned to Africa in 1924, working at Lambaréné until his return to Europe in 1927. He returned again to Lambaréné for a period in 1935, and returned again in 1937. He was again stranded in Africa during a world war, not returning to Europe until 1948. The Saint-Rémy-de-Provence hospital still has about 100 patients.